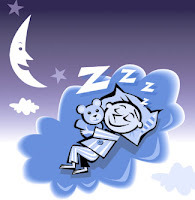 STAY FIT MINUTE: The Importance of SLEEP! Today I want to talk about an important topic that many people (including myself) often neglect: SLEEP! Getting sufficient quality sleep is integral to your physical and mental wellbeing, but in today's fast paced culture more and more busy people don't get enough of it. My hope is that sharing some of the benefits of sleep will convince you to make it one of your priorities. First of all, getting at least 7 to 9 hours of restful sleep each night will stimulate your body to produce higher levels of Human Growth Hormone. Among its many health benefits, HGH aids in fat loss while maintaining lean muscle tissue. Another important benefit of sleeping more is improved memory and concentration. Your physical performance will also improve noticeably, as well as your productivity at work or school. Studies show that those who get more sleep are less likely to have accidents or suffer injuries. In addition, sleep accelerates your recovery from physical activity and speeds healing of injuries if they do occur. Finally, sleep helps reduce the negative effects of stress on your body. This is significant because so many chronic diseases develop as a result of cumulative stress. These are just a few of the many benefits of sleeping well. •Go to sleep and wake up at the same time every day. Develop a routine. •Aim to get 7 to 9 hours nightly, getting to bed before midnight if possible. •Keep the room you sleep in as dark and quiet as possible. •Avoid any physical or mental stimulation right before going to sleep. Try not to watch TV or study at bedtime as it may make it harder for your brain to "turn off". •Avoid using sleeping pills or drinking more than one serving of alcohol at night. •Do not drink excessive amounts of coffee or caffeinated beverages during the day. Wishing you a good night's sleep!